I grew up on the east coast of Scotland, born to Irish parents. My earliest memories all revolve around drawing, encouraged by a mother who was also an artist. For me, drawing and painting are critical forms of communication – and meditation. I trained in Design at Cardiff Art College in the early seventies and then went on to train as a teacher for primary age children, with art as my specialist subject. My creativity – when the pressure of work allowed – has evolved in many different ways since that time through different stimuli, professions and occupations: teaching art to children and young people of primary and secondary age, adults with severe and profound learning disabilities; teaching gardening to children; working in community and domestic gardens and working around twenty years as a Social Worker. In addition, I worked as a library assistant for four years in the early eighties. Now retired, I have returned to my first love – drawing and painting. I am now a full-time artist who also writes. 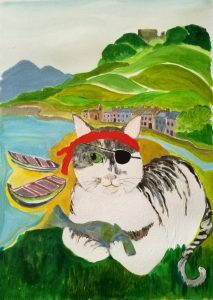 Much of my artwork and writing is based on themes relating to nature, my connection to it and to the animal world. In the past, I used words purely in note form to guide me in painting, but it was just shorthand for my eyes only. Over the years I have let the words expand into poems. Other work has begun purely as a series of visual images without words; the words come later. It can be difficult to explain why some ideas become poems or other pieces of writing, while others are so visual they become paintings or drawings. I just know what is right for me: I see some experiences as strong visual images suited to artwork only and others demand the written word. The Moon Hare poem was one of my poems accepted for Poetry NI’s Panning for Poems, issue 4, Jan 2016. 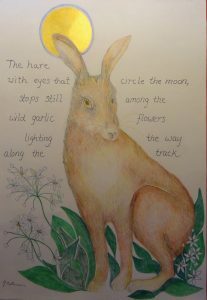 I initially created it as a poem on its own but later the image of the hare came to me and the two were combined. 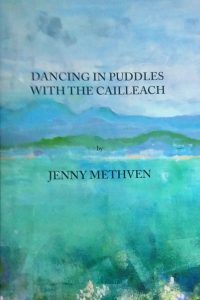 My book – the collection of poems, Dancing in Puddles with the Cailleach – is illustrated with my own paintings and drawings. I have created ‘glyphs’ (small black images – above) for chapter headings and illustrated maps for my husband’s historical novel, The Hare’s Vision. The glyphs are a means of adding interest and highlighting a general theme of the chapter; the maps provided detail of the journeys in the story. I love books. I spent a year working in a bookshop and four years in a library. It was close to being a chocoholic in a chocolate factory. I have grown interested in the book as an art form in itself, much like the early books created by Medieval scribes. At the moment I have several projects underway. One is creating illustrations for a children’s book I am writing. I began this when I was still teaching. 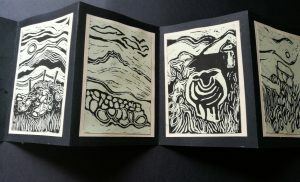 I am also using linocuts mixed with other media to create small books to illustrate particular poems I have written. Great to read about your adventures in retirement, Jenny. We miss you up here on the North Coast. Best wishes from you old friend, Harry.